The main level at 30 Windermere Lane in Stamford features a library with built-in shelving. A wondrous home that sits on the Mianus River, this 40-year-old masterpiece looks like something out of the world of renowned architect Frank Lloyd Wright. 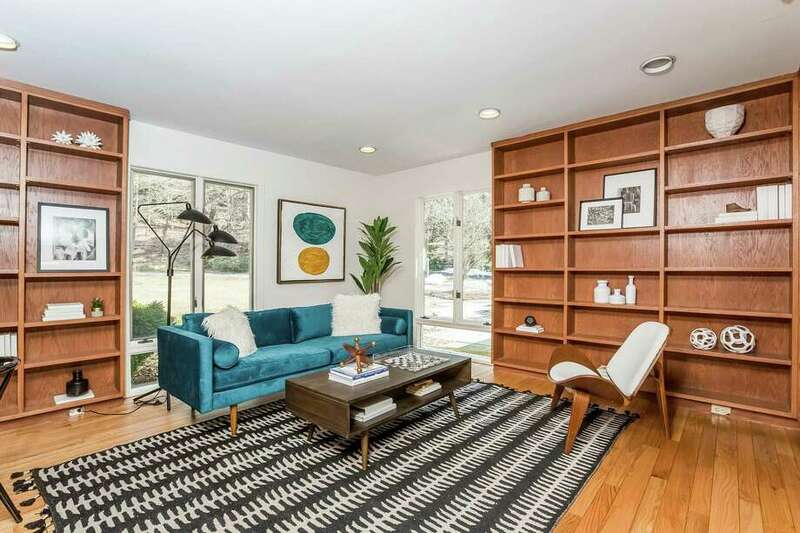 “It is very similar to a Lloyd Wright home as the back of the house is all windows and its sits on the river and you have the Mianus State Park on the other side of the river,” said homeowner Susan Webb, of 30 Windermere Lane in the Westover section of Stamford. Webb has lived in the home along with her husband, Nick, for 10 years. The creamy beige five-bedroom home has a lower level, main level and second level. The 2.86 professionally landscaped acres are also just 15 minutes from downtown Stamford and 15 minutes from Greenwich. The approximate 2,000-square-foot basement includes an open playroom/recreation room den. There is also a gym/workout space and a smaller sitting room that has sliders out to the river. There is also an unfinished storage room where the mechanicals are, as well as a half bath/powder room. Enter the main level and you will see a large foyer of which off to the left is a staircase to the upper level, Webb said. To the left of the foyer is an open plan living room/dining room. The living room, which is a few steps down, is full of windows. There is also a large white stone fireplace, built-in shelving and cabinetry. In addition, all the wood floors are refinished. Features: This home sits on the Mianus River and offers spectacular views. It is full of windows and is bright and light and the basement offers a gym/workout space. Schools: Roxbury Elementary, Cloonan Middle, and Westhill High School. The dining room, Webb said, has floor-to-ceiling windows. From the dining room, you can walk into the breakfast area or kitchen seating area, “which literally heads out over the river and has a small walk-out balcony where you can put another table out,” Webb said. The kitchen has all high-end, name-brand, stainless-steel appliances. “They are in a neutral tone. There is a Danish feel to the cabinetry,” she said. The kitchen eating area can sit between eight and 10 people. Walk through the kitchen ad past the main hallway and you’ll come to a dual desk office area with built-in cabinetry. There is also a laundry room which has access to the three-car garage and access to the lower level. The main level also includes a library. The master bedroom is also on the main level. It has an en-suite bathroom and a large walk-in closet. There are floor-to-ceiling windows and “you have a perfect view of the park and river,” Webb said. The master bathroom is all marble and includes a large sunken jetted tub with glass shower. The second level has four nice-sized bedrooms, including one that has an en-suite bath. The bedroom at the far end of the hallway, Webb said, is large and can be used as an art studio or drafting room. Listing agent: Seema Dohil, Halstead Connecticut, (203) 561-4212, SDohit@Halstead.com.